Am I the only one who hoards lipsticks like she's an old cat lady? I haven't gotten to the point of naming them yet, at least! But all you fellow makeup lovers can understand, I'm sure. 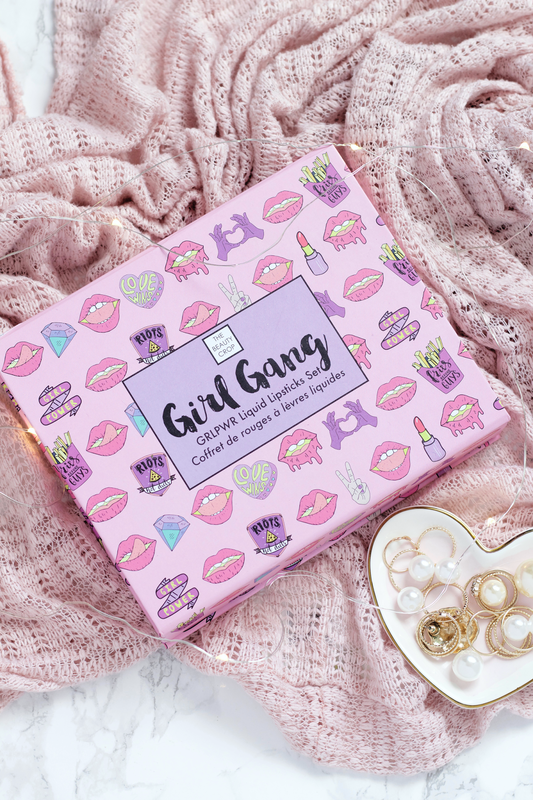 I was recently approached by The Beauty Crop with one of their newest releases, their Girl Gang Liquid Lipstick Set*, and thought I would finally review it all for you today (along with an opportunity for you to win one for yourself!). I couldn't wait to share this with you all. Before getting into the review itself, I want to talk about the brand. The Beauty Crop is an company that values healthy living and using natural ingredients for their beauty products. They have a philosophy of not using harmful or complex formulas, instead opting to create colorful, nutrition-rich cosmetics with plant-extracts, shea butter, and natural oils. They approach beauty through simplicity, authenticity, and performance, which is easily seen with their products. They also say they do not test on animals, which makes it even better using their products. They do not use parabens or phthalates, however they do use preservatives like phenoxyethanol. 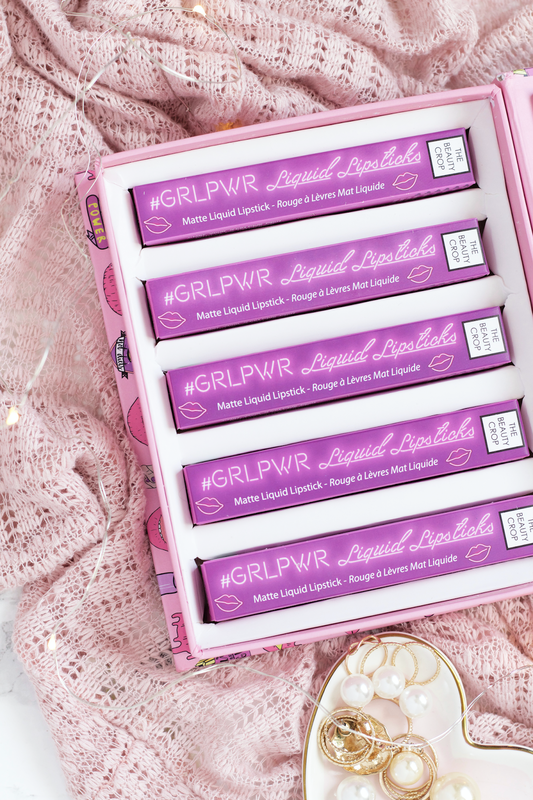 They recently sent over their Girl Gang #GRLPWR Liquid Lipstick Set* and it really made me appreciate all of the inspiring and motivational women that I know, both online and around me in my life. Through Instagram I've 'met' some really inspiring people, their individual personalities and creativity shines so bright. I want to always support and be there for them to help their success. There are of course times when I do feel jealousy rear its ugly head, but it's really all a relation to how negatively I feel about myself. It's a reminder for how I should not only focus on my own journey and work towards my own success, but also learn to love myself and treat myself better. Girl power is not only about helping to uplift each other but also helping to nurture, respect, teach, and love. We help nurture through our successes and our failures, respect each other through disagreements and appreciation, teach each other when we're wrong and with tolerance, and love each other when we truly need it the most. Girl power is during the easy times and also during the difficult times. It's obvious that right now the state of our world is very shaky but we need to be diligent to remember to support one another, not just white women helping white women, straight women helping straight women, or any other variant that has always been the acceptable mainstream normalization. All of us, with our girl power, need to help and accept one another in all of our diversity and differences. I think for me, this is truly what girl power means and represents. For mere aesthetics, I really love the frosted packaging. I think it makes the liquid lipsticks very unique amongst the many that are already out there, and with the rose gold etched on top it adds a very chic feel to it. Speaking of rose gold, I love that they opted for this color because I'm obsessed with anything having it. These have a bubble gum-esque scent to them but it's not at all very strong. They also are very light weight in your hand, easily thrown into your purse or makeup bag. There is 4ml per liquid lipstick and costs $14.95 each. These have doe foot applicators that pick up a good amount of product when you first take it out. I like to use that amount as a single layer and then gauge if I need to dip back to apply a second. These are pretty opaque with a single layer so I rarely felt the need to do a second. These do tend to dry quickly and I would compare them to KVD consistency. I've been using Aromatherapy Associates Hydrating Moisturizing Lip Balm since it has a base of cocoa butter and is very moisturizing, and that has done the trick to keep my naturally dry lips from becoming chapped. They are really comfortable to wear as long as you have a good base underneath, and even if you don't they aren't super drying due to the shea butter included in this. The wear time of these I would say is around 4-ish hours before I feel the need to touch up or possibly fully re-apply the color itself. If you're someone who works long shifts then these might not be the best to wear but maybe a night out or shopping date would be the most preferable. I definitely think that Greige Expectations is my favorite. 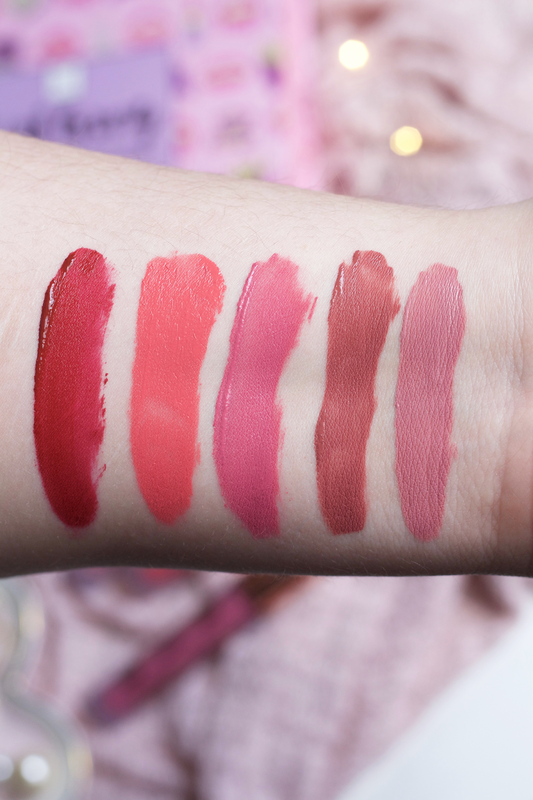 If you haven't seen yet, also check out Jenn's post here about these liquid lipsticks. She has some great thoughts about them and her photos are stunning. I have a surprise along with this post! The Beauty Crop was kind enough to offer all of you a chance to win this limited edition set! All you need to do is fill out the form below and do all the mandatory steps. This is open for U.S. residents. Good luck!